This is a great book, fun to read, and although it is over 300 pages it doesn't take long to read through it because it has pictures and large font. This book is so packed with information (much like Think Big and Grow Rich) that I would recommend taking your time reading and highlighting things that interest you and then go back through again to make sure you remember the information. People are often shocked when they see books that I read because they are marked, highlighted, and sometimes written in. As far as i'm concerned, what's the point of the book if you can't remember what you read? And you can't remember if you don't make notes! I am going to turn this review into a series much like the Think and Grow Rich Series. This will be the "Basics of Body language", next week will be "Interviews, Power Plays, and Office Politics" and the week after that will be "Eye Signals." To be fair to the authors I am picking only a few sections, so if you want to learn about "Courtship Displays and Attraction Signals", "How the Legs Reveal What the Mind Wants to Do", or "Arm Signals" you will have to find and read the book yourself [cue shameless plug for our local public libraries]. the verbal component of a face-to-face conversation is less than 35 percent and over 65 percent of communication is done nonverbally. Women have between fourteen and sixteen areas of the brain to evaluate others' behaviour versus a man's four to six areas. This explains how a woman can attend a dinner party and rapidly work out the state of the relationships of other couples at the party....it also explains why, from a woman's standpoint, men don't seem to talk much and, from a man's standpoint, women never seem to shut up. One of the biggest mistakes a novice makes is "interpreting a solitary gesture in isolation of other gestures or circumstances. For example, scratching the head can mean a number of things--sweating, uncertainty, dandruff, or lying--depending on the other gestures that occur at the same time. So, it's important when reading someone to look at as many things as possible and putting them together before coming to a conclusion. Research shows that nonverbal signals carry about five times as much impact as the verbal channel and that, when the two are incongruent, people--especially women--rely on the nonverbal message and disregard the verbal content. In other words most people are really bad liars, if person A says that they are in a "great mood" but have their arms crossed and their legs crossed that is a physical position that is not 'congruent' with someone who is in fact in a 'great mood'. All gestures and body language reading should be taken in context of the situation. If you take my example from above . If you ran into Person A in the middle of winter and it was freezing cold, the reason why his arms are crossed and legs are crossed is simply because he is probably just really cold. 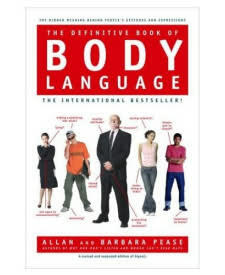 Becoming a great body language reader takes time and active practice however it's rewards are invaluable because "it not only makes you more acutely aware of how others try to dominate and manipulate, it brings the realization that others are also doing the same to us and, most important, it teaches us to be more sensitive to other people's feelings and emotions."